A simple amino acid, l-proline, can separate cannabidiol – one of the most pharmaceutically interesting cannabis components – from the more than 100 other cannabinoids in plant extracts by forming a cocrystal. The researchers say that co-crystallisation is cheaper and easier than other purification procedures, producing more than 99% pure cannabidiol. However, separating CBD from the 112 other major cannabinoids in plant extracts – including the psychoactive tetrahydrocannabinol – isn’t easy. It involves a series of extractions, filtrations, chromatography and crystallisations. 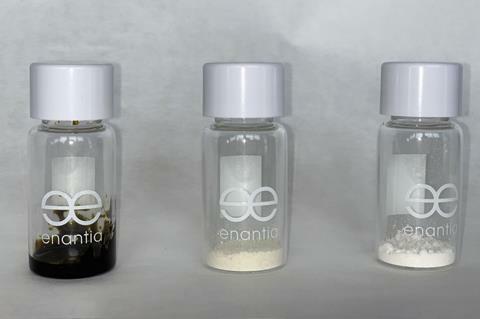 Enantia’s researchers can draw out cannabidiol from the chaotic natural extract mixture by co-crystallising it with any of proline, betaine, carnitine or an octahydroindole carboxylic acid. Cocrystals are held together by weak forces such as hydrogen bonding, van-der-Waals interactions or π–π stacking. However, they often have properties, like melting point or bioavailability, that differ from the individual components. The cocrystals can be broken down to recover more than 99% pure cannabidiol. But since the co-formers are also approved for pharmaceutical applications, the cocrystals could be used directly as drugs or food additives. Bučar points out how difficult it is to pinpoint the right crystallisation partner, or co-former. Although crystal engineers choose functional groups to maximise interactions between the co-formers, ‘it’s a trial and error procedure most of the time’. Feixas can’t disclose how he chose the co-former or how many were tested, but says that Enantia relies on its researchers’ experience rather than any computational methods. However, GW Pharmaceuticals, which produces cannabidiol drugs in the UK, isn’t convinced. ‘GW’s existing crystallisation technology allows us to produce an extract to >98% purity therefore not making this technology vastly different,’ a spokesperson says. Feixas and his team are now searching for compounds that can separate out other cannabinoids. ‘There are many interesting minor cannabinoids whose pharmacological investigation is restricted due to the difficulties in isolating them,’ says Sara Preciado, Enantia’s head of innovation.